Here’s a hot new instant win game from Snickers! Now through December 12th, you can enter the Snickers NFL Super Bowl Instant Win Game for a chance at winning 1 200,200 prizes! No touchdown! But you still can win a free SNICKERS because hunger happened in the NFL this week! Quick, head to our Facebook Messenger Bot to receive your free SNICKERS bar before we run out! https://bit.ly/2OvHBJy No purch nec. 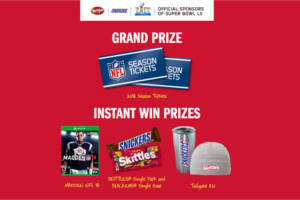 Snickers & Skittles are hosting a brand new instant win game and give you the chance to win FREE Madden NFL games,Free Team Snickers and Team Skittles tailing Kits, Free Skittles and Snickers candy coupons, and Season tickets to any NFL game for two! Snickers teaming up with Skittles to brought you The Super Bowl LII Rivalry 2018 Sweepstakes where you could win two (2) Season tickets to the regular season 2018 home games of an NFL team of your choice and other instant win prizes.